It’s a worthy name; the Greek translation is “venerable.” It began to be widely used in the third century after it was the name of a Christian martyr…so it’s certainly manly enough. Sebastian also has British ties. It’s in the Top 100 list of boy’s names. Sebastian Cabot is a British actor; Sebastian Faulks, a British writer. And there are characters named Sebastian in popular British fiction, including Sherlock Holmes and Brideshead Revisited. Most importantly, I like it. Look, I’m only trying to expedite the process. Princess Diana and Prince Charles took seven days to name William; William and Kate took three weeks to name their dog, Lupo; and Queen Elizabeth and Prince Philip took a month to name Charles. 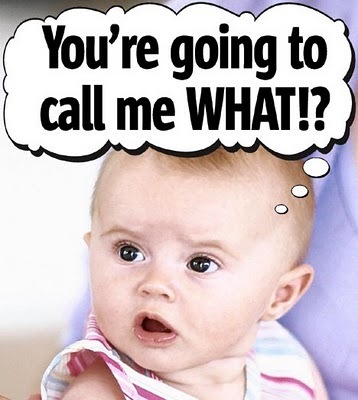 Let’s not give the child an identity crisis! This entry was posted in Celebrities, Children, Commentary, Entertainment, Family, History, Humor, Life, News, Politics and tagged actor, babies, baby boy names, Brideshead Revisited, Britain, celebrities, children, Christian martyr, commentary, Duke and Duchess of Cambridge, entertainment, family, fiction, Greek translation, His Royal Highness, history, Humor, identity crisis, life, Lupo, news, politics, Prince Charles, Prince Philip, Princess Diana, Queen Elizabeth, Sebastian, Sebastian Cabot, Sebastian Faulks, Sherlock Holmes, Sir Arthur Conan Doyle, venerable, William and Kate, writer. Bookmark the permalink. Hey, isn’t that also the name of the prince in that royal book you read when you were three? With Princess Gabriella? No. Those two princes were Alexander and Bennett (and their sis Gabriella — nickname Brie). But points for remembering the series!